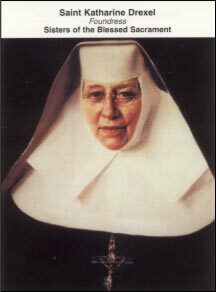 Today’s theme is “generosity.” When I think of this word, the first person who comes to mind isn’t someone who was married in her lifetime, yet she embodied the spirit of self-giving love: St. Katharine Drexel. Born to wealth and privilege, she spent the greatest part of her inheritance to improve the lives of minority children. Have you ever wondered why Jesus said that it was easier for the camel to go through the eye of a needle then for the rich to get into heaven? Wealth can have an isolating effect. So, ironically, can poverty . . . if you grasp what you do have too tightly. On the other hand, we can never out-give God. Those who are determined to be generous with their resources often discover that God repays them in full many times over! When was the last time you were generous with God? Is he presenting any opportunities to you right now?